Family trees on FamilySearch can store huge amounts of information about your family. This is one of their greatest strengths. Sometimes sorting through this amount of information, or even figuring out what information your tree contains, can feel overwhelming. 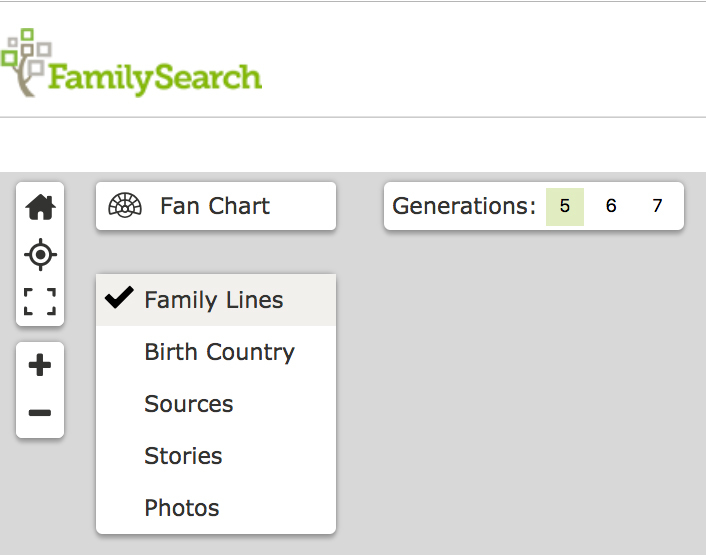 That’s why FamilySearch has released a new version of the fan chart. This new fan chart provides an overview of up to 7 generations of your family tree—and helps you see your tree in a whole new way. In just one glance, you can discover your ancestral heritage or learn which family members have an abundance of sources, family photos, and family stories—and which could use a little more work! Viewing your family in a fan chart is simple. From the Family Tree page on FamilySearch, click the arrow beside Landscape to see other viewing options. Then select Fan Chart. This will build a fan chart starting with the person you have in the primary position. You can also access the fan chart directly. To see a fan chart starting with someone else on your tree, simply find that person on your fan chart, and click on the name. A box with basic information about the person will appear. At the bottom, you can select Tree or Person. 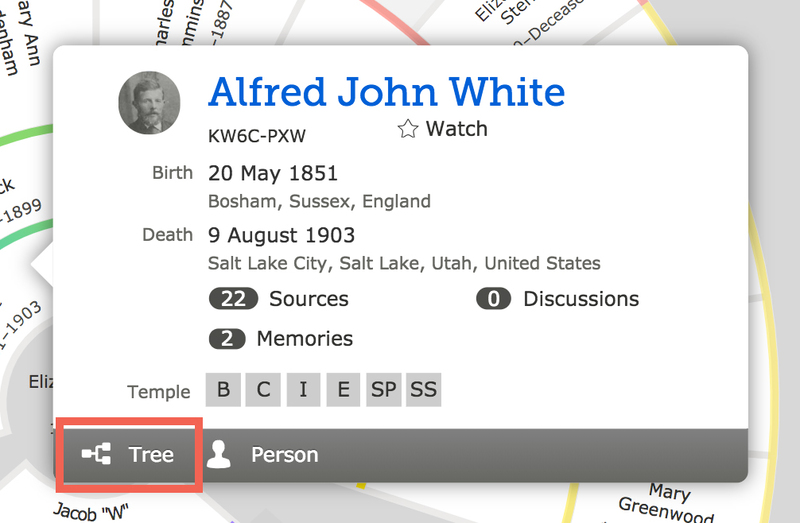 If you select Tree, FamilySearch will build a fan chart with that person at the center. Once you’re on the fan chart screen, you’ll see several new options. For one thing, your chart can now display 5, 6, or 7 generations. You can also choose from several display themes: Birth Country, Sources, Stories, or Photos. In each case, the fan chart still shows the ancestors’ names as well as birth and death years. However, now the chart blocks are color-coded. A key on the side tells you what each color represents. This makes the information easy to digest quickly. For example, choosing Birth Country will bring up the fan chart colored according to where each ancestor was born. 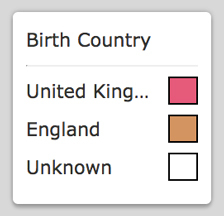 In the example shown, ancestors born in the United Kingdom are colored with pink blocks, while those born in England have orange blocks. When you choose a different display option, the fan chart is color coded according to how many of that particular item (sources, stories, or photos) each ancestor has. 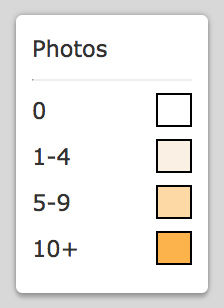 From the key displayed here, you can see that in this example, ancestors with 10 or more photos have the darkest color blocks. Those with fewer have lighter blocks until those with 0 have white blocks. When using these new fan charts to look at your family information, you’re bound to make some new discoveries. Instead of scrolling through your tree or clicking on individual screens to gather information one piece at a time, you can now get an overview on one screen. Ever wonder how much German heritage you have? Or what your strongest ancestral heritage is? Now you can see this on your FamilySearch fan chart. 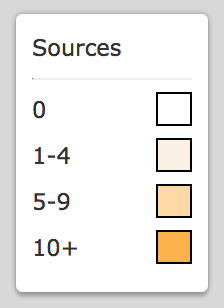 The color-coded fan chart also helps you recognize patterns you might not have seen before. Maybe one branch of your family tree is filled with sources and photos while another branch hardly has any. With this understanding, you can more effectively focus your attention on a particular family or branch. Maybe you will want to spend some time reading stories you hadn’t realized existed. Noticing some branches of your tree that don’t have sources or photos may inspire you to add some yourself! 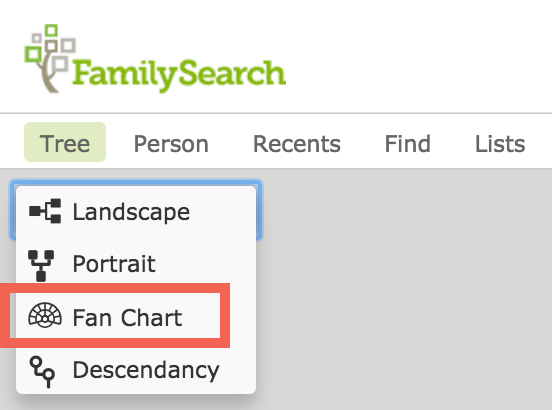 The next time you’re looking at your family on FamilySearch, take a moment to try the new Fan Chart view. You just might see your family in a whole new way.